Sealaska Heritage is sponsoring the Haa Shuká Community Language Learning Project, a new program designed to help revitalize the languages of the Tlingit, Haida and Tsimshian in four Southeast Alaska communities. The new project pairs fluent speakers of Lingít (Tlingit), Xaad Kíl (Haida) and Sm’algyax (Tsimshian) with intermediate and advanced speakers in those languages to increase learner proficiency. Language mentor-apprentice teams will meet weekly to immerse themselves in their respective languages over the course of three years. Language learners will also enroll in language courses through the University of Alaska Southeast (enrollment will be paid by SHI) and work independently on transcriptions of language recordings and documents to build their fluency. Participating communities are Metlakatla, Hydaburg, Sitka and Juneau. As part of this project, SHI has established a Southeast Regional Language Committee to provide guidance for the language teams and to help integrate the project with existing initiatives across the region. SHI will also work with the committee and regional groups to organize monthly language events and biannual immersion retreats in each partner community that will be open to the public. Project partners include the Sitka Tribe of Alaska, the Haayk Foundation, and Hydaburg City School District. SHI’s Haa Shuká Community Language Learning Project is the most recent in a series of initiatives that SHI has implemented since the late 1990s to help document, preserve and revitalize Southeast Alaska Native languages. Though significant progress has been made in that time, most fluent speakers are elderly, and the need for projects such as this one remains urgent. For more information, contact project coordinator Jill Meserve at Jill.Meserve@sealaska.com. (Flyer) Sealaska Heritage is partnering with the Sitka Tribe of Alaska to host community language sessions in Sitka. The theme for the session is Valentine’s Day—learn Valentine’s phrases through games. Please RSVP to Lakrisha Brady at 907.966.1350 or lakrisha.brady@sitkatribe-nsn.gov. Open to all levels. Children should be accompanied by an adult. Everyone is welcome! (Register) (Flyer) Sealaska Heritage will sponsor a three-day Lingíit immersion retreat in Juneau. More details coming soon. (Flyer) Gather together with other language learners for an hour of conversation immersed in the Tlingit language with our Haa Shuká mentor-apprentice teams and X̱’unei Lance Twitchell. Open to all levels. Everyone is welcome! Statement: I want to continue learning and teaching our language in any arena available and am grateful for this opportunity to learn side by side with a peer and from a fluent speaker. Statement: The time is now to learn our native languages, which embodies who we are, making the connections to our ancestors, traditions and culture! Bio: Paul learned Lingít from his parents and family. 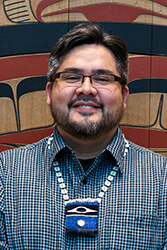 Paul also participated, as a mentor, in Sealaska Heritage’s “Bridging Challenges to Fluency through Partnerships: A Tlingit Mentor Apprentice Language Program”. Statement: Paul believes that it is important that we learn from our ancestors and honor them. It is most important that we learn from our ancestral true language and give honor to ancestors. When we honor our ancestors, we honor our future generations and ourselves. 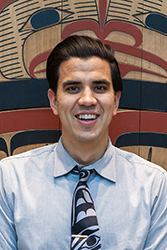 Bio: Kyle studied Anthropology and Alaska Native Studies at the University of Alaska Anchorage. 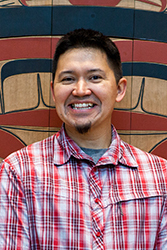 Kyle co-teaches a Lingít language course at UAA with elder Shirley Kendall and coaches Native Youth Olympics in the Anchorage School District. Kyle is moving to Juneau to continue his commitment to learning and revitalizing the Lingít Language. Bio: Ethel has been sharing her cultural knowledge to ensure that the culture would never die. Ethel worked as a Cultural Instructor for over 20 years with the Sitka Native Education Program. Ethel helped develop many of the materials used to teach the Lingít language and was a part of a number of transcription and translation projects. Ethel has attended and presented at numerous workshops and conferences. Ethel feels fortunate to have worked with and learned from many of the elders who are no longer with us. Bio: Kassandra moved to Sitka when she was five or six years old and has been living there since. She has been studying the Lingít language with encouragement and instruction from her mother Roby Littlefield and their teacher Daasdiyáa, Ethel Makinen. Kassandra has participated in Lingít Language immersion retreats, language teacher conferences, and teaching and learning techniques. Kassandra is looking forward to this program to increase her learning and speaking abilities and to learn new ways to share with others. Kassandra has always felt enriched and encouraged after participating in language gatherings. Bio: Lakrisha grew up in the Sitka Native Education Program (SNEP) and graduated in 2010. Currently, she is the Cultural Specialist at Wooch.een Preschool, a culturally-responsive preschool program that operates in collaboration with Sitka Tribe of Alaska (STA), the Sitka School District, and Central Council Tlingit and Haida Indian Tribes of Alaska Head Start. Lakrisha hopes to enrich students’ lives with Tlingit language and culture the way that the elders had done for her. Statement: "I just feel it's really important. I've been worried about the language and I want to do as much as I can while I can to teach it. It scary because of how fast it’s disappearing." Statement: I want to become fluent in the language of my ancestors and be able to see the world from their point of view. Then we can pass it on to my people and help restore the rightful pride and identity that all Tsimshian should have through knowing who they are. We are reclaiming our birthright and there is nothing more important that I will ever do. Statement: I’m extremely grateful to Sealaska Heritage Institute for recognizing the importance of Sm’algyax; investing in our community; and holding these four communities, speakers and learners up to create a stronger, united Southeast Alaska. Lu’aam goodu nwil Da’ałga dm di hoksgu a hałelsa gwa’a! I am happy that I can be a part of this work! Statement: For most of my adult life I have been involved with a Haida dance group from Seattle, WA. Without knowing Xaad Kíl, I feel like I am missing out on the true meaning of what our songs, stories, history and traditions are about, let alone creating new ones. I am very excited for this opportunity to be a part of the Haa Shuká project and the revitalization of our ancestral language. Statement: I grew up in Hydaburg and had the privilege of knowing all our great elders from Hydaburg, Alaska. Being selected to learn Xaad Kíl will be a journey in building my knowledge in my Native heritage. I am looking forward to learning and listening to the language of my ancestors. Hudson is one of three founders of the Haayk Foundation, along with David R. Boxley and Kandi McGilton. The nonprofit’s mission is to preserve, promote and revitalize Sm'algyax, Ayaawx (traditional Tsimshian values and protocol), Adaawx (true history), and Luulgyit (validating cultural practice) in order to cultivate a positive and healthy identity for the people of Metlakatla. Although he is not yet a fluent speaker, Hudson has logged hundreds of hours working with fluent speakers and is proficient in reading, writing, and transcription in Sm'algyax. In 2016, as Project Coordinator for the Tsimshian Education Achievement Model grant project, Hudson helped to create the Wap Lip Algya̱g̱m House of Our Language 0-3 Years Sm'algyax Curriculum. Hudson is also a Tribal/City Councilman at Metlakatla Indian Community. Young learned X̱aad Kíl from his grandfather, Claude Morrison Kúng Skíis, a respected Haida elder who lived to the age of 100. As a teenager, Young taught his first language classes at SHI’s Latseen Leadership Academy. Through other language projects and programs, Young has worked with elders Woodrow Morrison, Alma Cook, Annie Peele, and Erma Lawrence. Over the years he has also been influenced by linguist Dr. Jordan Lachler and Gwich'in instructor Hishinlai' Peter.